LuckyDino is an online casino registered under the Laws of Malta in the European Union and Regulated by the Malta Gaming Authority. Its range of games are provided by Net Entertainment, and it includes Classic slots, Video poker, Video Slots, Scratch games, and Table games. These games are available for instant play through a browser. Up to 16 scratch games are offered by LuckyDino, and few selections of outstanding ones are also offered which may include Keno. Their Video slots are selected from NetEnt, Bally, Williams Interactive, and Microgaming. The LuckyDino casino uses the most advanced security and encryption technologies known as Secure Socket Layer (SSL), to ensure that all financial and personal details of their players are entirely safe and secure at all times. They also ensure complete fairness in their games by using the Random Number Generator certified by NetEnt. This casino uses the same algorithms for games played with either fun money or real money, and they offer a wide range of PCI compliant payment methods to protect your withdrawals and deposits. At LuckyDino casino, you can set different personal limits for yourself when you feel you’ve spent too much time playing, or you’re reckless on your budget. This may be made possible by contacting their customer support. Currencies supported by this casino include Euros, US dollars, British pounds sterling, Swedish kronor, and Norwegian kroner. Languages supported are English, German, Swedish, Finnish, and Norwegian. LuckyDino has a fabulous reward system for its players. With a welcome package of 7 instant free spins upon signing up, you’re sure of an awesome experience in the games. Your casino gameplay can be more exciting with the reward system from Dino. All you have to do is to play your favourite games and get free spins, super spins, and mega spins that are completely wager free. Making your first deposit will give you a 100% deposit bonus of up to €200. Also, you’ll be credited with 50 free spins on Copy Cats slot after 24 hours. Your second deposit also comes with a mouth-watery deposit bonus of 50% up to €200, and 50 free spins on Twin Spin online slot. The free spin winnings have no wagering requirements, so what you win is completely yours. That’s many rewards from Dino. But there is a wagering requirement on all deposit bonuses, which is 50 times (50×) the bonus. The validity of this bonus is 7 days from the day such deposit was made, and deposits are credited instantly to your LuckyDino player’s account. The minimum deposit required from every player is €20. At LuckyDino, every spin counts, and all spins are lucky spins. You can collect special rewards from this casino during the gameplay. On the video slots, every spin gets you closer to your next reward spins. It’s always easy to follow the reward progress on this casino. All you have to do is to open the game and follow the Rewards progress bar when you spin the reels. You can also play your favourite slot games on the go with your mobile as LuckyDino is fully optimised for mobile devices such as Android and iOS. So, no matter where you are, you can follow your reward progress on your mobile device by accessing the progress bar under the “My Account” tab. Games can be accessed using the “Search” function or preferably, by scrolling down the page. The games included here are Allens, Lights, Big Bang. You’ll also have access to the Live chat support with the mobile casino. The safe and secure withdrawal methods offered by Dino include Credit/Debit cards, online banking, and E-wallets. The minimum withdrawal is €30, and the maximum is €20,000 monthly. Each withdrawal has a processing fee of up to 3%, that is a minimum of €2 and a maximum of €25. All withdrawals on this casino are processed in a very fast pace to enable you to enjoy your winnings as soon as possible. E-wallet withdrawals take 24 hours, withdrawals with Credit/Debit cards is 5 business days, while wire transfers may take up to 5 business days. To Dino, speedy withdrawal process is as important as the safe and secure withdrawal methods. So, be assured that your payout request will be processed very fast. Check more of our casinos with fast withdrawals. You can play there and be sure that it’s easy and fast to get your winnings. 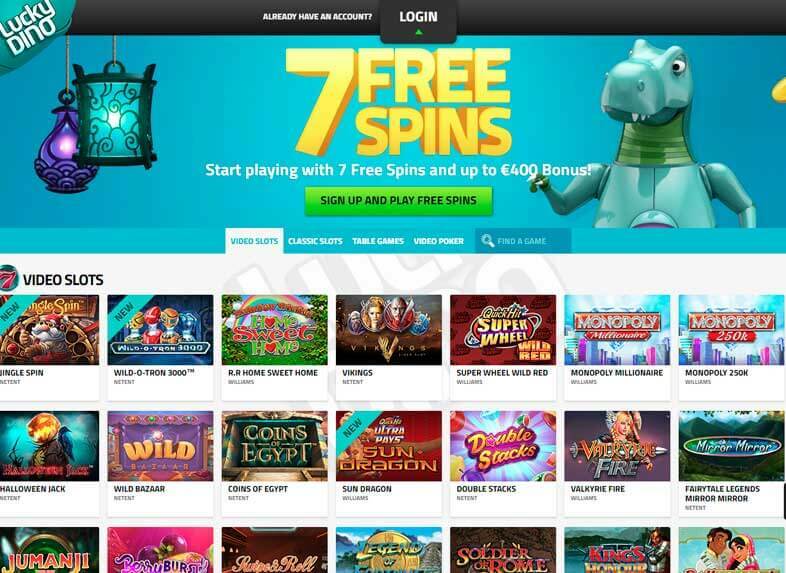 It takes only a few minutes to open your free LuckyDino casino account and enjoy the wage-free sign-up a package of 7 free spins on the NetEnt Lights online slot. No deposit is needed to get this free spins, and that is a great way to start your adventure either with your mobile device or on your desktop computer. To receive your welcome package of €400 and up to 100 free spins with extra spins, register now to start playing by clicking on this ”Play now” button. It is as simple as that. Players can get in touch with the Live Support which is available between 09:00 – 01:00 CET every day. You can also drop a message at any time when the Live chat is unavailable, through their online web form, and you’ll get a reply soon. This casino has Curacao as its jurisdiction, but it’s not accessible to residents of Curacao. Other countries also restricted include Israel, United Kingdom, United States, Hungary, Afghanistan, and Australia. Playing the LuckyDino casino is fun and exciting, with a great user-friendly interface and a lightning fast payout. It has multiple payment and withdrawal methods, and it's fully optimised for mobile devices. The downside of this casino is that the Live Chat is not 24/7, and it has a few selections of Video Poker games.